Luffa is a funny name for a Vegetable so tasty! When I read Luffa, I think of soap and a hot bath. In fact my thinking isn’t that wrong, because this particular vegetable isn’t just an amazing food item but in the same time a very popular natural sponge since the beginning of time. However, the Luffa vegetables here in Goa/India is actually not known to be a bath utenzile, that’s why it took me sometime to make the connection at all. Nevertheless, we have been cooking this spongy gourd type since ever, at least my family here, I only learned about the existence of the vegetable some years back. You know India has a bunch of different languages, and so everything has a couple of names such as the Luffa, which is also known in the sub continent as Ridge Gourd, Gossai (Konkani), Ghosavala (Maharathi) and Turai (North India/Pakistan). The plant grows further too in Africa, in the Arabs, South East Asia and even in Paraguay/South America. The use of Luffa sponge was already known back then to the Egyptians and Romans. Apart from cooking, the fibrous inner plant parts are still used in bathing accessories, as a cushioning material and in Paraguay apparently they use the dried vegetable even to build houses. Unfortunately, I have no idea how they do it, but I surely want to check that out on my own self. It seems that the skin of the plant is removed and the inner soft sponge is kept in the sun to dry well. For cooking, only the young gourds are used, while for the sponge material, mature dry vegetables are used. While researching for this article I came across an other insight of the ridge gourd. When the young vegetable/the seeds are eaten raw or when it is juiced and consumed it can help to cure Jaundice! Maybe some few older generation locals from Goa might now this already, but I surely didn’t! You see in India there are a lots of jaundice cases, already in my family they have been a few live threatening cases. Often it is difficult to cure the illness and modern medicine often fails for some reason. So, many people try out Ayurveda or natural medicines to get rid of the hepatic liver problems. Patients are often advised not to consume any Protein type of foods such as meat and Eggs, so a Vegetarian diet is absolutely required! A Vegetable that promotes the liver health, can of course only be of great value in this world, and then too it tastes wonderfully! Normally, healthy vegetables are usually very bitter or taste horrible and for once, nature has left us a little surprise on earth, to boost our health! 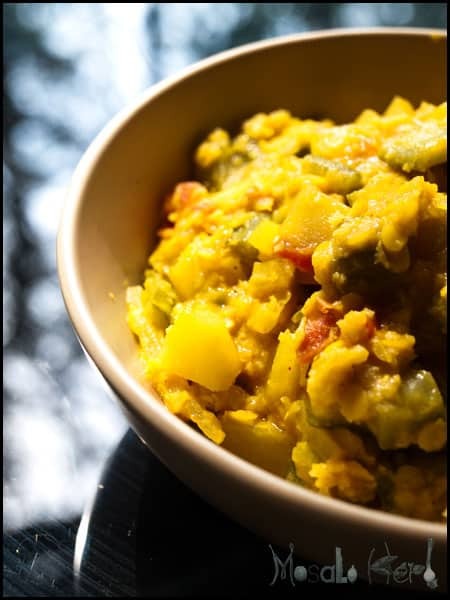 In our family recipe we even add a little amount of red lentils to the “Gossai Bhaji”. The combination of flavors is a real treat and super healthy with the use of Turmeric, Ginger and Garlic paste, who have antibacterial/antiseptic properties. To enhance the taste and to give the dish another dimension, we add some freshly scraped coconut. The dish is a combination of Vitamins, Minerals, Proteins and Essential Oil, which makes it perfect for those of us who have cut out carbs from their diet. Of course if you would like some carbs, then you can always serve it with some rice or fresh chapati bread! The Luffa gourd requires to be scraped, that means that the corners are peeled mostly. The rest of the dark green skin is left or barely scraped. The flesh inside should be still soft as shown. Cut the Onion and Tomato into cubes. In a pan add the oil and fry first the Onion translucent then add the tomato pieces. 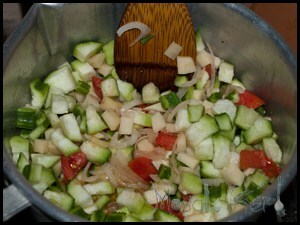 Continue to add the Luffa pieces and keep on stirring while frying for 2-3 minutes. Now pour in the water, add the Lentils and season with all the above mentioned ingredients (Salt, pepper, Turmeric, chilli, Garam Masala and Ginger Garlic Paste). Leave the bhaji pot to simmer for 15 minutes at least. Right before serving stir in the Scraped Coconut and serve hot. A fantastic, easy and, I am certain, tasty recipe! I must admit to two loofahs in my shower and none in my kitchen – just a little time for homework, please or a fully-blown/grown zucchini may have to take its place 😉 ! Hi Eha! Thanks for your comment! The best substitute to Luffa is zucchini as u mentioned, it will taste pretty much the same, just that luffa is not that juice and much more spongy. I’ve only ever seen these dried and ready for the bath.. it looks terrific though! I remember these angled gourd…my mom cooks vermicelli soup with them. Yours looks very tasty with red lentils. Hi, this may be interesting you: Luffa - Ridge Gourd Bhaji!